It has been fairly obvious to me over the recent months of re-ownership of Sacré Bleu that I need to get fit again to sail this boat, - well actually just to sail. And so I have passed on SB to another owner who will spread the experience of 3.7 ownership to another part of the country. Whilst I get back into shape on one of the machines above, in readiness for the next 3.7. These things run HIIT programmes (high-intensity interval training ) which is I'm reliably told the fastest and best way to get in shape. It seems it is also the type of training responsible for giving Andrew Marr his major stroke! So as long as I survive I should be back-back in the game shortly. So I've had a run of bad luck with the wind. None - then bonkers gusty (28knts & big shifts) - then perfect but a lake full of 150 Optimists and now what was forecast to be 8-10mph was nothing like that. Oh well I went out today anyway to make sure the alterations I've done to the mainsheet set up work. I'd measured and measured but you don't really know until you sail, if what you've done works. One of the reasons I wasn't keen on 15 gusting 28 to trial the new system. But I can confirm it works. The extension makes it past the kicker, if I point it toward the cockpit floor (advice taken from the NZ fleet) when tacking. A little bit more thought is required when gybing, making sure you have pre gybed the extension or you are in trouble. But apart from that I MUCH prefer the positioning of the mainsheet off the boom!! It is so much more sensitive, it's directly in your eye line. Rather than looking at the bottom of the boat for the tail of the sheet and allows you to keep your weight forward all the time. I had no issues with the 'horse' hooking the stern quarter either. Which I was please about, and thought might happen but didn't. I'm also happy with the reconfiguration of the control lines. They are all nicely elasticated now, so you can just grab the line, un-cleat and let go and the elastic take the line down to the deck. Rather than before where the lines were run though fixed deck bullseyes on the side decks and you had to adjust the line from inside the bullseye, which was awkward to say the least. The other thing I've realised is I am ENORMOUSLY UNFIT! I have lost almost all my aerobic fitness over the last 4 years and it really shows. I'm going to have to do something about it, as the sailing skill memory seems to still be with me, but I'm going to be a liability to rescue crews if I don't get some fitness back soon! As if to prove this, I went for a run the other day and I almost keeled over. This part of the plan may take a bit longer than I was hoping! We've had a succession of weekends / weeks with no wind or a day of dogs off chains. Which for the bored sailor wanting to remember how to sail his old boat, can only mean one thing. To dangerously start cutting things up and changing the sheeting system around on his boat! Above is the new shorter version of my rudder, which in combination with a slightly shortened tiller extension should allow me aft sheeting with centre boom take off. Fingers crossed all the measuring and trialling the boat on land will translate into a system that works on the water. I wanted to try it on Sunday, but the wind Gods were playing silly buggers. With a really shifty and gusty breezy day. A great 11knts but with gust into the high 20's. Combine this with loads of rain and BSC's notorious shifty lake (+/- 20º) and I thought better of it. So till the next time. Fingers crossed my mods have worked! PS... I've just realised I need to do some mods to my trap harness too. It seems to have shrunk whilst languishing in my sailing bag! The weekend was the first opportunity to get Sacré Bleu wet, but unfortunately the weekend was totally windless. But I was determined to at least get it wet. Just to remember what to do, and give the boat a lightest of shakedowns. Which raised the need to sort the elastic for the centre board. You'll notice the new electric motor I've installed along with the mast mods. 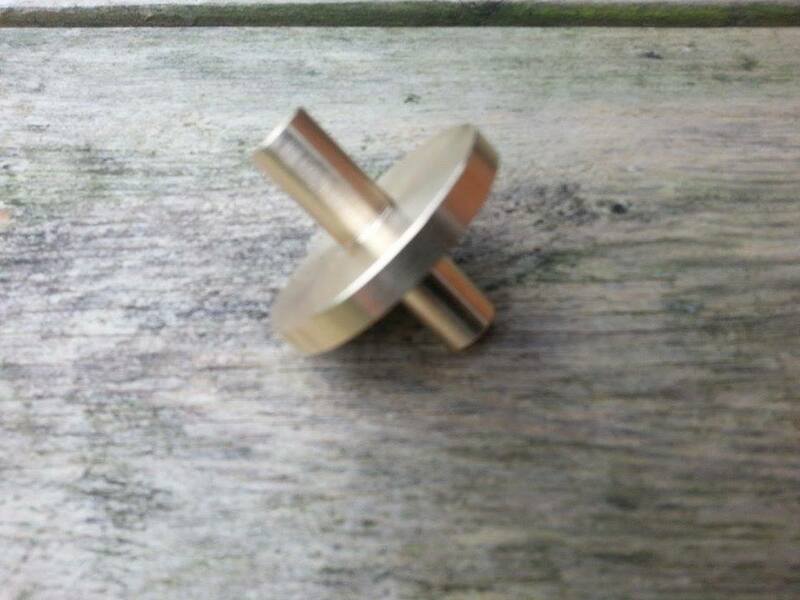 A big thanks to Jeremy who made the new mast foot for me, he's an absolute star. All I can say his I owe him a lot of beers, as a new one form C-Tec was costed up at $250NZD! 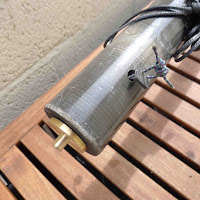 I knew that I would have to do some extra work to the mast foot when I got hold of it. 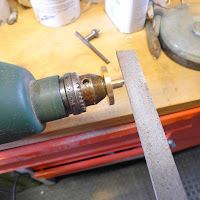 As I'd intentionally over estimated the spigot lengths to make sure I had enough length to enable me to make adjustments when I received the foot. 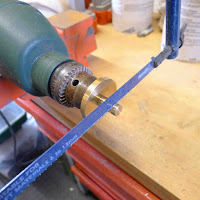 So how do I make the mods to the mast foot when I don't have a Lathe? Use your power drill as a Lathe! 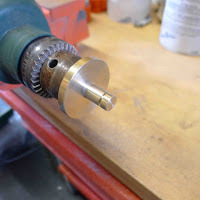 I clamped my drill in my vice, put the brass mast foot in the drill chuck, turned on to a high speed and used a file and hacksaw to make the mods. Surprisingly simple. 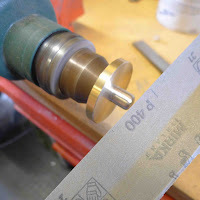 I needed to shorten the bottom spigot and round off the end. To help when the mast is placed in the foot socket. Plus - I didn't want to lose the mast foot again. So I need someway of stopping this. I stepped the top spigot down. Flattened one side and drilled through so I could attach a dyneima loop to the mast. 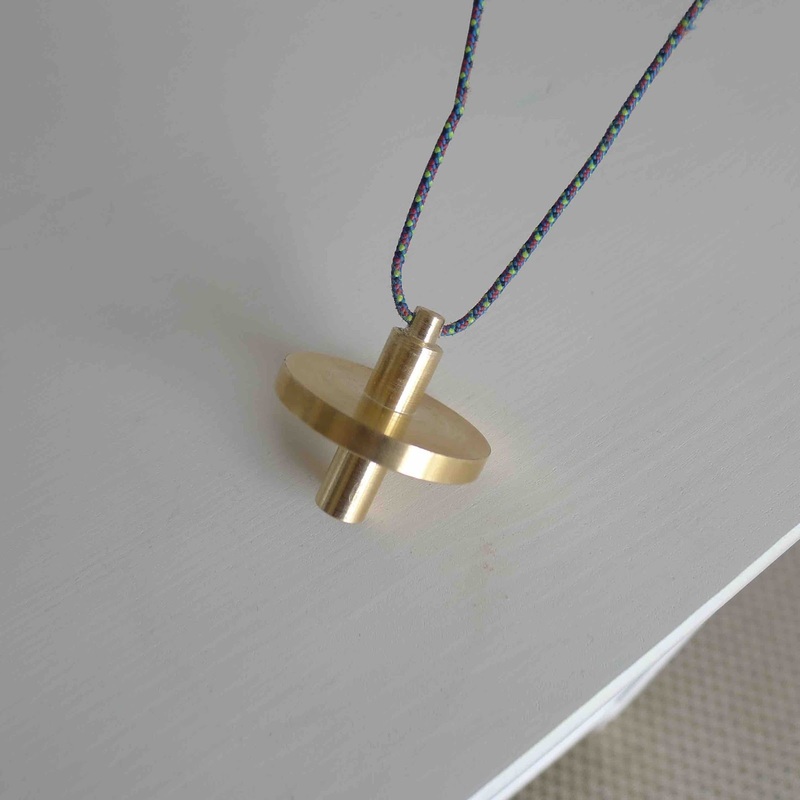 Bobs your Uncle - no more lost mast foot! What can I say - JC has performed a miracle! That'll be Jeremy Carey just to be clear. 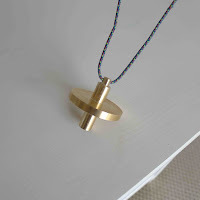 Thanks to his fabulous skills with a lathe I may be able to get sailing soon! So jobs to do. It's been awhile since I've sailed, and to be frank the uniqueness of rolling the boat over for the small performance gain I have decided is not worth it. This may have something to do with age? Needing to save as much energy as possible? ;-) or just that the foreshore in the UK is never really conducive to this procedure. Oh and the fact that the original downhaul line was about to break. Which meant it needed to be changed anyway. Unfortunately this meant 'Drimmeling' out the spinnaker piston lock that the mast was originally built with, so I decided to put a mast head sheave box in instead. Tick. After spending the requisite - almost £30 for a 10ps worth of injected plastic. Just because it is to do with sailing. I installed the mast head sheave. Meaning that I now have a conventional external main halyard system. No more rolling the boat over. Tick. Next carbon over the holes that the old halyard system used. As a test for the super out of date epoxy. To my surprise the glue worked fine! Ace, my wallet is relieved. I think it's important to seal the mast. Especially the opening at the mast head. 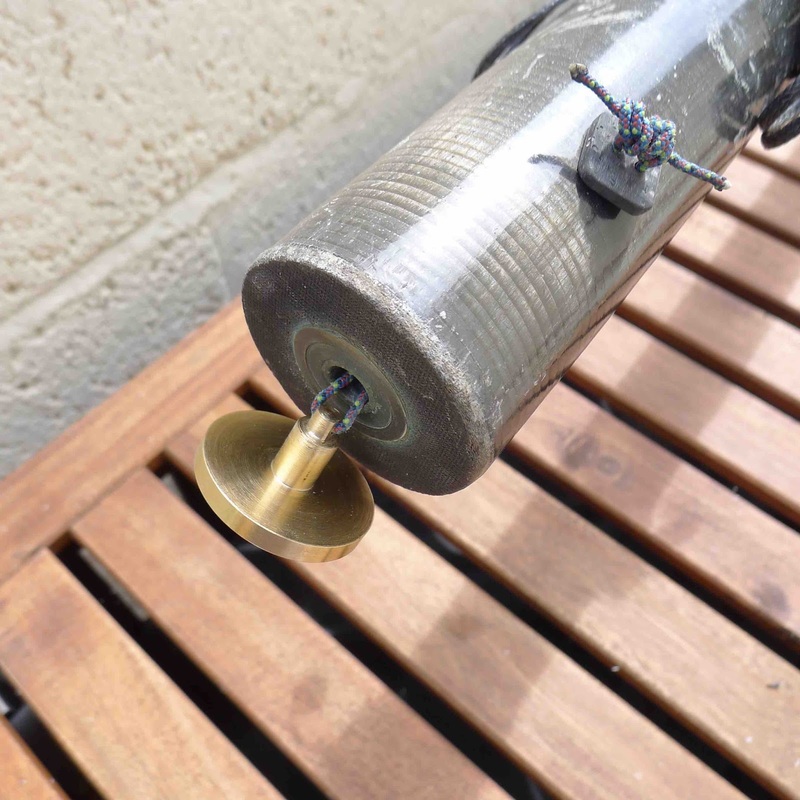 This should stop / slow the water coming in the mast when capsized. Giving me a little extra time to get not the board. Doh! Whilst transporting the mast I seem to have lost the rotating mast foot. Balls! This is a problem, I'm hoping it fell off in the boat park. Otherwise it's air freight from NZ time, as they are not an off the shelf item. I'm really do hope I can find this sucker, as I need to get my water wings before October and the Lyme Regis S.C Nationals. It's been quite a while since I last sailed (4?5? years! ), and I know fitness is going to be an issue as I know I have a complete lack of it. My back isn't getting any better with age. Sitting at a desk all day, Scoliosis, tight hip flexors from a reasonable youth athletics career and falling out a tree all cause me quite a bit of pain. One of the reasons I went for the 3.7 in the first place. Hiking killed my back. Now to replace the 'intermediate shrouds'. Originally #384 had 3mm wire inters bonded to the mast. After a while sailing the boat the electrolysis created between the carbon and the stainless corroded the wire at the intersection. Causing the wire to break. At the time I decided to replace these with SK78, believing in the hype about it's, No / V Low stretch qualities. This resulted in a loss of power. As they did stretch. Guy who I bought the boat back from had had some wire inters made up. So whilst sorting the mast it was a good time to put these on. Now for the big test of the glue! I shouldn't have worried! I was intending to sink the hard eye into a bog mix of glue, by wrapping it down with peel ply. I wasn't working slow, but it seems 10am sun shine and a black mast was to much for my filler mix, and it went off before I got the carbon top layer over it and wrapped it down. Meaning I now have a large bump on the front of my mast. Oh well I'm sure it will be secure enough. It just doesn't look very pretty. At some point I may cut it back and re-do it, but for now it will have to do. Need to get on the water. 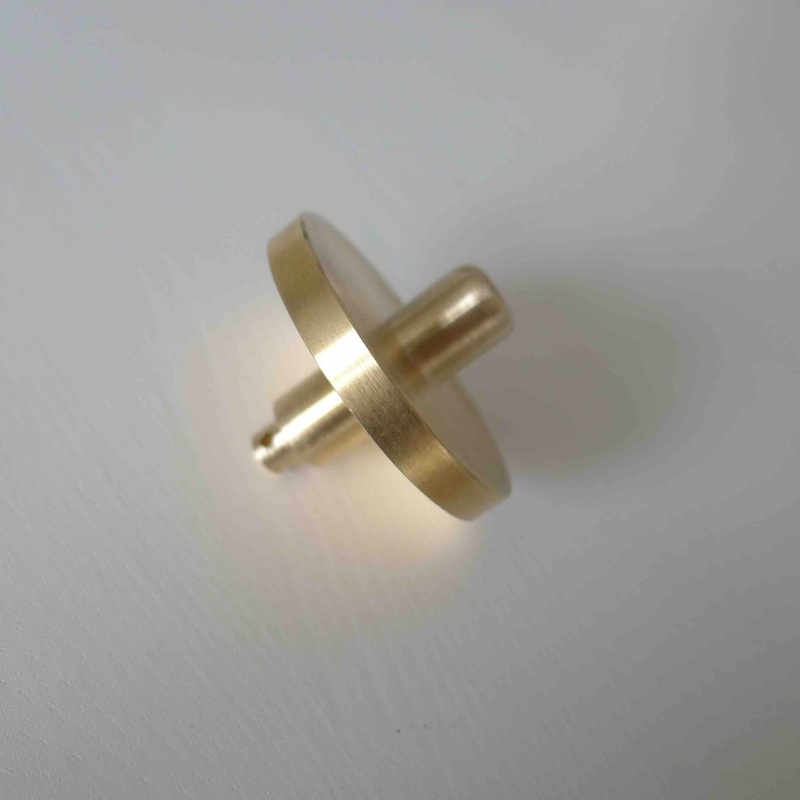 BTW - if you see a brass fitting that looks like this at B.S.C it's from my mast!!! Send me a message here!